Timothy Pope, Timothy Pope, what can you see through your telescope?Join a little boy on a trip through the park. Is that really a shark he can see? Look through the die-cut hole and then turn the page and find out . . . A hilarious peep-through board book from the bestselling Nick Sharratt. A wonderfully surprising peep-through book with a hilarious rhyming text - now available as a board book for the very youngest readers to enjoy. 5.0 out of 5 starsFantastically Fun! From the colorful front cover to the delightful ending, this is a wonderfully repetitive book that finishes with a delicious surprise. I've read this book innumerable times to patrons and guests of the Children's Museum of Denver and to Head Start classes throughout the Mile High City and it has never failed to charm my audiences. The book is artfully designed with full-color illustrations throughout and ingenious cut-out overlays that enhance the story. I enjoy any book that can be acted as much as read, and this book lends itself to over-the-top gestures. The clever refrain also encourages listeners to join in the narration and will leave them smiling at the end. My 2 year old son loved this book when we got it from our local library. So much so that we had to buy it for our home library. 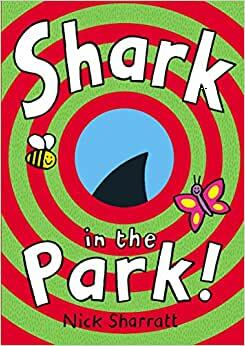 The mix of short phrases that rhyme and actions (looking up, down, left, right, and around) make this a great read-aloud and ideal for a storytime. 5.0 out of 5 starsFun for reader and listener. Having used this book many times as a Children's Librarian, I knew it would be a hit with my young grandsons. And it was! The two year old walked around saying "shark park". There are great ways to make this story interactive: looking up, down,around with Timothy, asking what do you think will happen next, repeating the refrain. A fun story for the reader and the listener. 1.0 out of 5 starsThe worst book I have ever received from Amazon. The book did not fit in any way shape or form, the description. It is filthy, has damaged binding and corners and it actually smells as if it has been pulled from the trash.